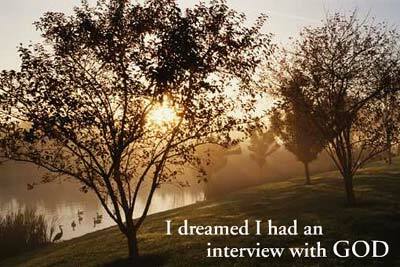 You’ve been granted an interview with God! How much time do we spend listening to the Lord? Isn’t it a shame that we go to him talking and talking and very seldom listening to him? If a student were studying a sport or a musical instrument under a master teacher, would he spend all of the time telling the teacher how bad he is at his sport or his musical instrument? Would he constantly try to tell him how he could improve in his art, or would he sit and ask the master to teach him what he needs to do to be better at that sport or at that musical instrument? So it needs to be with us and God. Our job is not to dictate to the Lord how we think he should be running the world, but to turn to him and ask him what he wants us to do to make the world a better place, and to change my life so that I will be the person he has created me to be.